July 2015 Akademia Music Award Winner! 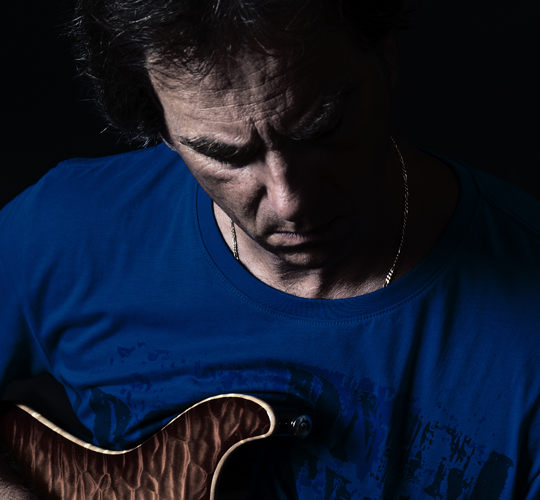 Welcome to the official website of Igor Memisevic, a rock/blues musician and guitarist based in The Netherland. Although I do not have a degree in music but I've been giving guitar lessons to beginners since 1999. I never toured heavily with a band although I have played with many throughout the years. I used to do some vocals, but I´ve mostly been playing guitar. For almost 25 years and counting! I began playing guitar on November 16th 1991. My early influences, amongst others, were bands such as Led Zeppelin, Deep Purple and Black Sabbath. Later on I discovered the blues/rock-field and began listening to various other bands: Free, Jimmy Hendrix Experience, Cream, Bad Company, Jeff Beck Group, Ten Years After, AC/DC, Johnny Winter. At the age of eighteen me and many others were all blown away by an original and amazing new group: Van Halen (with off course the extraordinary Mr. Eddy van Halen on Guitar). I've had two guitar teachers so far who both graduated from the Rotterdam Jazz Conservatory. The first taught me from 1991-1998 and the second from 2000-2005. I never toured heavily with a band although I have played with many throughout the years. Two bands come to mind with which I've had a tremendous feeling and trust. So I thought this might work on a professional level. The first band we named "Better World". Back then we made a significant cd/demo with six songs and played in local bars in Croatia (monthly paid gigs). As a band we competed with many other bands from our province and beyond for a local competition and become fourth out of fifty! Not bad for a such a young band (1989-1990). You can check out our demo in my Media page. In 1991 I moved to Holland; War started in Croatia. Although I do not have a degree in music but I've been giving guitar lessons to beginners since 1999. In 2006 I played in the cover band "After Midnight". We played four live gigs as a band within a period of ten months. We also professionally recorded one of our covers called Love Rears It's Ugly Head by Living Colour. Check it out by clicking the Media button above! In 2009 I finally realised my very own cd with original songs written by me. I collaborated with my former guitar teacher Axel Gunning and my former cover band female singer Marianne van den Meer. The result is an album with nine songs called "Keep It Cool", which is also free to listen to on my Media page! I'm a main composer since 1988 although I also used to do the vocals for Better World. In June 2010 I attended MCMP (Musical Carriere Mentoring Programme) Internet course authorized by Tom Hess. In March 2012 I have been graduated and as a final result we as a group of his students released following CD "SONGS OF THE PHOENIX 3 compilation CD contains 11 songs and I have had a great privilege to close this project down. COOL.